The Service for Gladys has been rescheduled for Saturday, June 9, 2018 at 11:00 A.M. with a visitation one hour prior at Faith Lutheran Church in Balsam Lake. 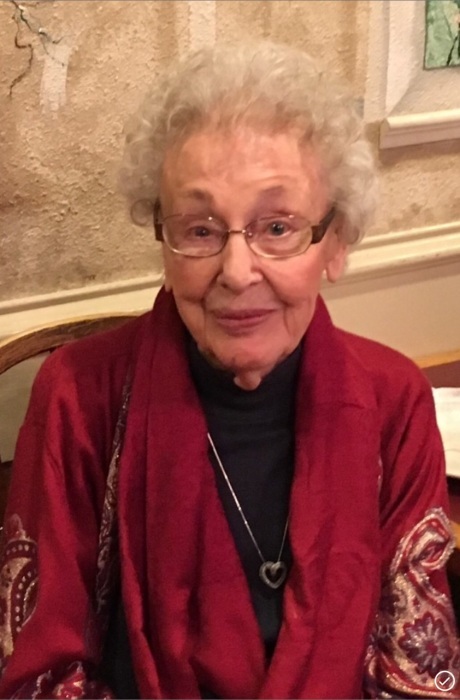 Gladys Opal Frokjer, 96, passed away peacefully on Sunday, February 11, 2018. Gladys was born March 15, 1921, in Dresser, Wisconsin to Valborg E. (Hanson) and Henning T. Lindahl. She was born and grew up on the family’s dairy farm, of which she told and wrote of her many cherished memories. She was confirmed at Sand Lake and was also a long time member of Faith Lutheran Church in Balsam Lake Wisconsin. After graduating from St. Croix High School in 1938, she went on to Polk County Normal and received her teaching certificate. Her love of education did not end there and in 1959 she obtained her B.S. degree, while still teaching. Through her career, Gladys touched many lives in countless ways and made lifelong friends, whether they were teachers or students. On June 5, 1943 she married the love of her life, Howard Frokjer and settled on their first farm in Dresser, Wisconsin, in which she hung the “red gingham curtains” she always had envisioned. Some years later, they sold the farm and purchased the Ace Gas Station at Centuria, Wisconsin, and also built a Tastee-Freeze Drive In. They purchased a lake home on Balsam Lake, Wisconsin, in 1956, where many happy years were spent. It was with the abundance of maple trees and good friends; they started their Kemah Park maple syrup endeavor. In 1974, Gladys retired early from teaching to care for her aging mother until her death, then pursued her other interests. After they moved from the lake to a nearby farm, her love of decorating and antiques again flourished. In 1986, they sold the remainder of the farm to the Five Flags Golf Course and they moved to Texas in 1989. Their time in Texas was again filled with new friends and activities. In 1999, they returned to Luck, Wisconsin to make their home there. Sadly, in 2001, Howard passed away and Gladys went on to live her life to the fullest, although alone. She returned to the Balsam Lake area and spent time decorating her new home and became a member the “PoCo Penners”. She wrote many endearing stories of growing up, family, and adventures. She again moved back to St. Croix Falls in 2008 and became part of the “Pine Court” gang. Weekly coffee parties and great conversations were an enjoyed activity. She was always thrilled to make new friends while keeping her shopping trips and lunches with her closest friends and nieces. In 2011, she was overwhelmed by the love she was shown at her 90th birthday party and couldn’t believe it again in 2016 at the age of 95, that so many family, friends and former students came together just for her. She became a resident at Royal Oaks in Osceola, where she was met with open arms into a new family. There she met old friends and again made new friends, including Kayla, who formed a special bond with Gladys and along with all of the staff kept a watchful eye over her. Macular degeneration was slowing robbing her of eyesight, her ability to drive and her voracious love of reading and crossword puzzles. With a suggestion to the Lion’s Club from a dear neighbor, Gladys received her own magnifying reader, which allowed her to read again. In 2017, she became a resident of Christian Community Home in Osceola. She again became endeared herself to all the staff and residents, who fondly called her “Gladdy”. Gladys was the oldest of four siblings whom all preceded her in death, her sister, Doris Klein, and brothers, Gordon, Donald and Gerald (who died at birth) Lindahl. Gladys was an amazing, intelligent, loving woman who will be remembered for her kindness, devotion to family and friends, independence, friendship, patience, sense of humor, quick wit and perfect manners. She will be sadly and forever missed by her nieces, nephews, great nieces and nephews and great-great nieces and nephews, which include the Kleins, the Lindahls, the Frokjers and the Rogers families and other loving family and extended family and friends. A Memorial Service will be held on Saturday, June 9, 2018 at 11:00 A.M.. at Faith Lutheran Church in Balsam Lake. Gladys’ family will greet visitors from 10:00 A.M. - 11:00 A.M.. Please join the family for a meal and fellowship in the church fellowship hall following the service. Gladys will be laid to rest at the Bethesda Church Cemetery in Sand Lake. Honorary Pallbearers will be Richard Klein, Jim Klein, Tom Klein, Jeff Warner, Brian Lindahl and Terry Lindahl. Please no flowers but consider a donation in Gladys’ name to the Interfaith Caregiver's of Milltown, WI or the Lions Eye Club.